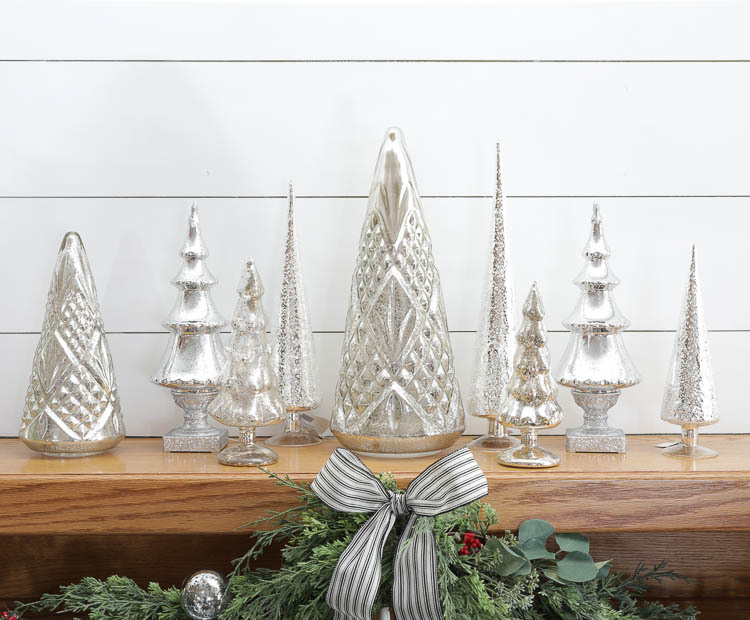 This stunning Christmas fireplace mantel is decorated with realistic cedar garland, white velvet stockings and a forest of lighted mercury glass trees. I had the chance to put together a dreamy neutral Christmas fireplace mantel this week and I have to say I am obsessed with how it turned out. Obsessed! 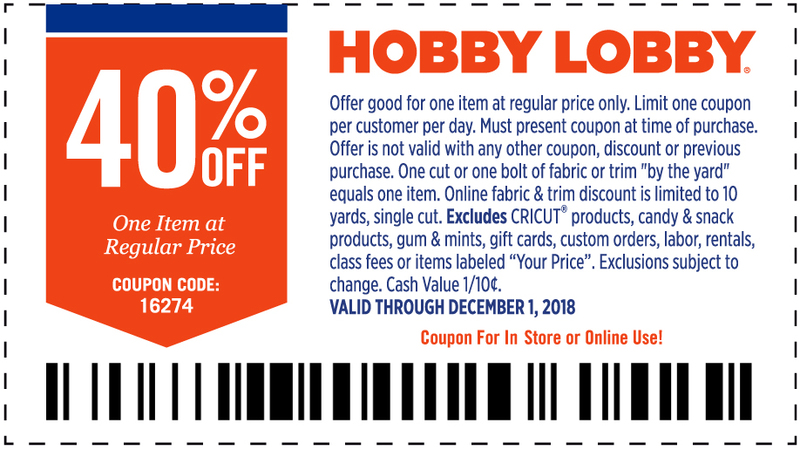 Thank you to my partners at Hobby Lobby for sponsoring this post. You all know that my love for Hobby Lobby runs deep, so when they challenged me to put together a beautiful holiday fireplace display, I was pretty darn excited. 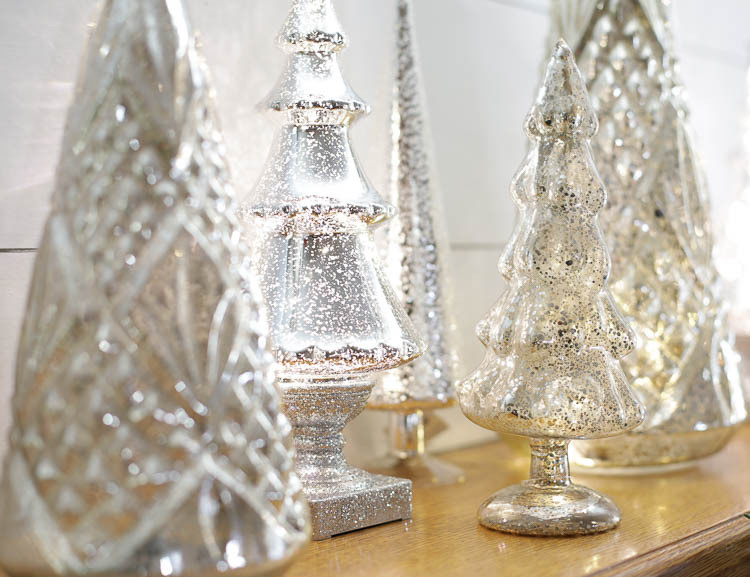 As soon as I stepped into the store, I fell in love with these mercury glass Christmas trees. They are Just. So. Pretty. I love the “collected” feel, almost like I’ve been slowly acquiring them at antique stores for years. And some of them even light up! 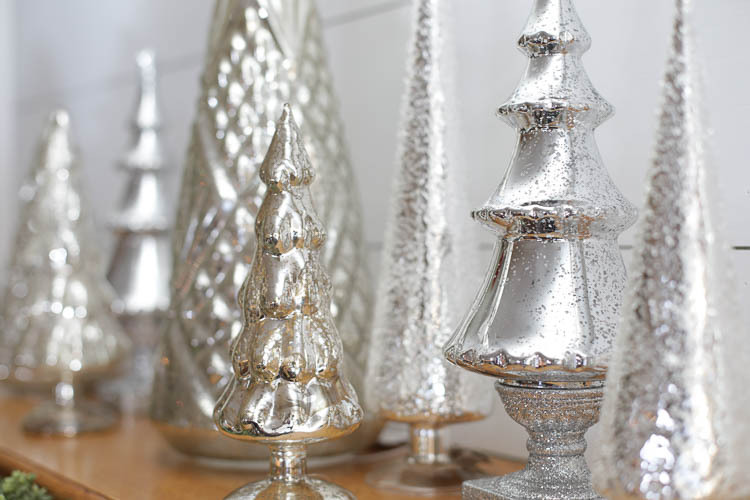 Once I had my heart set on the mercury glass, I went hunting for garland. And I fell in love again! 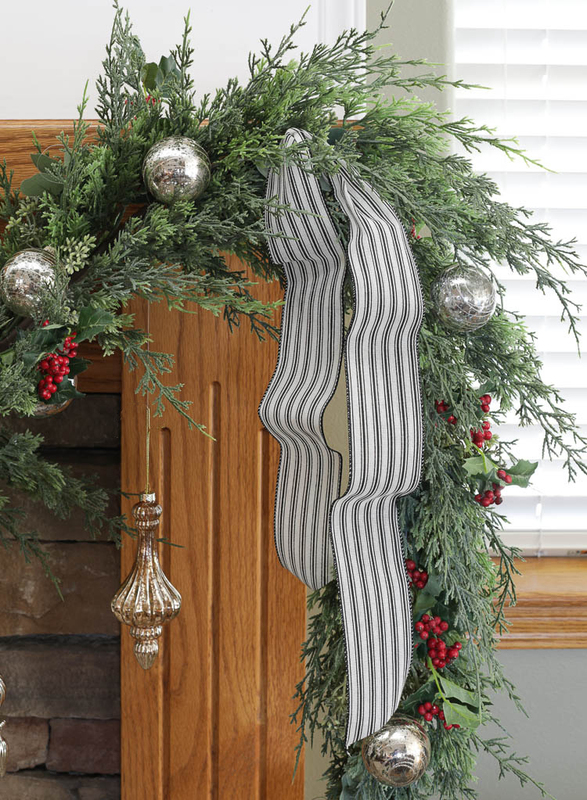 This cedar garland looks SO realistic and has the prettiest drape. It has a few red berries here and there and little bits of eucalyptus and other greens to make it feel super lush. It was so pretty as-is that I didn’t have to add much to finish it off. I went searching in the ornament aisles for some mercury glass ball ornaments and found two different styles, so I added those to the garland with florist wire. They had a whole collection of spindle shaped mercury glass ornaments, so I hung those from the garland using fishing wire, just to add another interesting element, and I love how it ties the whole thing together. 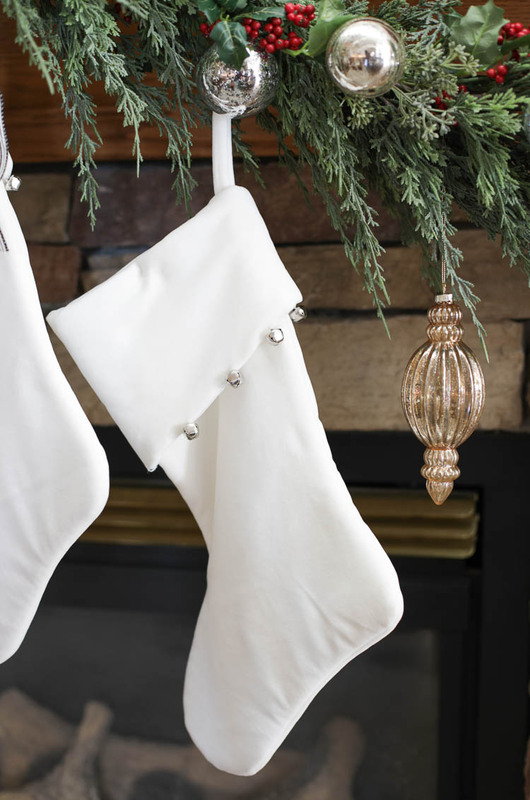 The white velvet stockings kept things cozy and neutral. And then the last touch was the black and white ticking stripe ribbon. 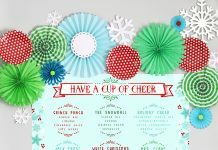 It can be found in the regular ribbon aisle that’s in the sewing section, not the Christmas section. I used it in my fall decor and loved it so much that I wanted to use it again for Christmas. 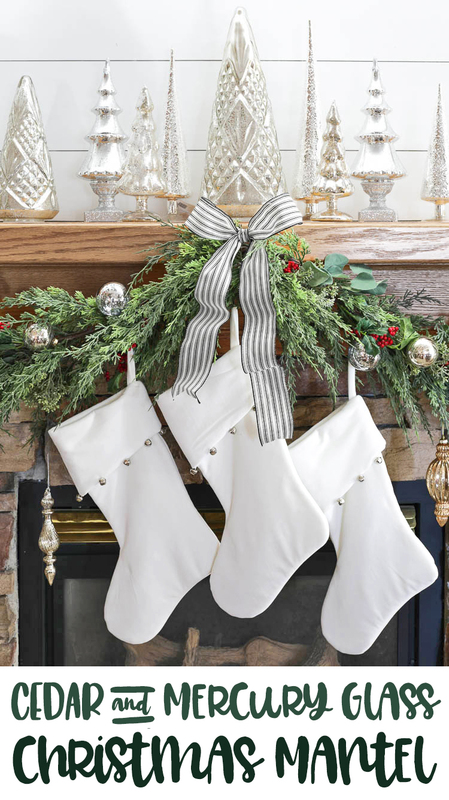 I used three large, clear Command hooks stuck to the fireplace mantel to hang the garland without damaging the wood. 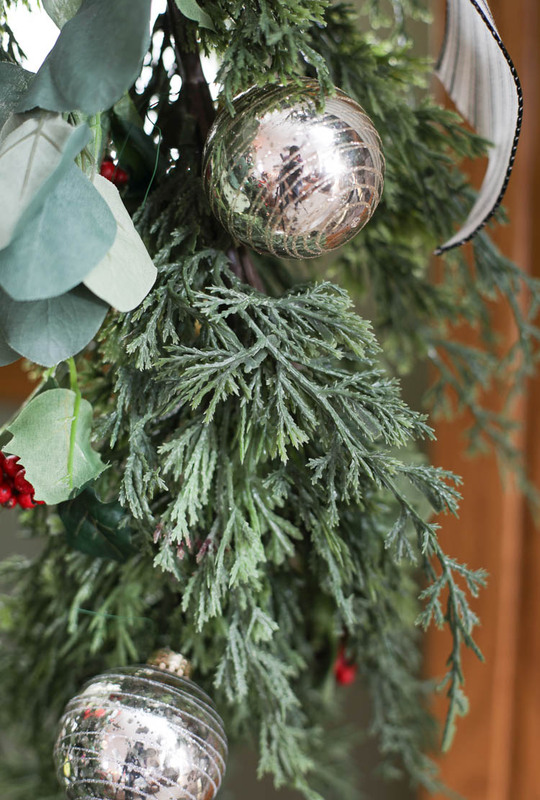 All of the ball ornaments are attached to the branches of the garland with florist wire. To hang the dangling spindle ornaments, I used clear fishing line tied to the branches of the garland. 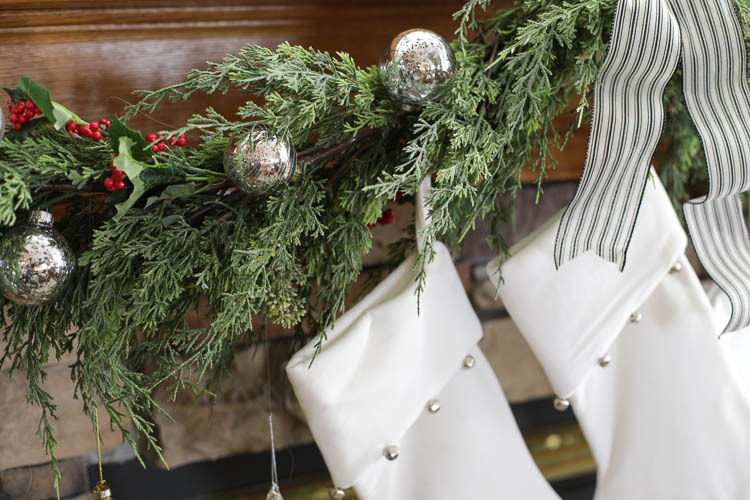 The stockings are attached directly to the garland using florist wire as well. PRO TIP: When working with delicate glass ornaments, I like to lay a big, thick blanket on the ground under where I’m working. Then if I happen to drop an ornament, it’s a lot less likely to shatter. I didn’t add lights to my garland this time, but when I do, I like to use fairy lights that run on batteries so I don’t have ugly cords running off the sides. Overall, I am just tickled with how this look came together. 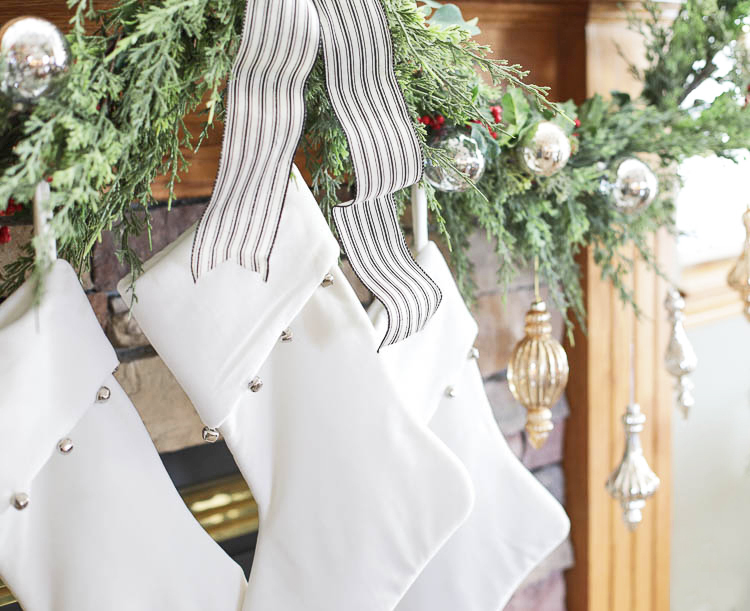 It’s cozy and glam at the same time and neutral enough to match well in anybody’s home. I put together a source list of the items I could find online to help you replicate the look. If the item isn’t hyperlinked, it’s only sold in-store, which means you’ll have to go wander around Hobby Lobby. Oh, shucks. Wink wink. 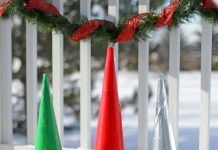 Right now all of the Christmas decor is 50% off, but be sure to print out a coupon or open one up on your phone for anything that’s not already on sale.